YOUR CHOICE TO RIDE IS VOLUNTARY. WE TAKE CARE TO PROVIDE SUITABLE SAFE PONIES AND HORSES FOR OUR CUSTOMERS. HOWEVER, ALL ANIMALS CAN BE UNPREDICTABLE. WE STRONGLY ADVISE YOU TAKE FULL PERSONAL ACCIDENT COVER. We want everyone who joins us for riding lessons to have a safe and enjoyable time. Please arrive 10 minutes before your lesson so you can get ready and make sure you make yourself known to a member of staff when you arrive. All riders need to fill out a rider registration form before they ride, we have these at the centre or if you wish follow the link to print a copy prior to your visit. Current safety standard hats are provided and you should wear long comfortable trousers and a top that covers your shoulders. Any jewellery should be removed and long hair tied back into a low ponytail with no grips or clips under your riding hat. If you wish to bring your own riding hat, it must be PAS 15 approved. 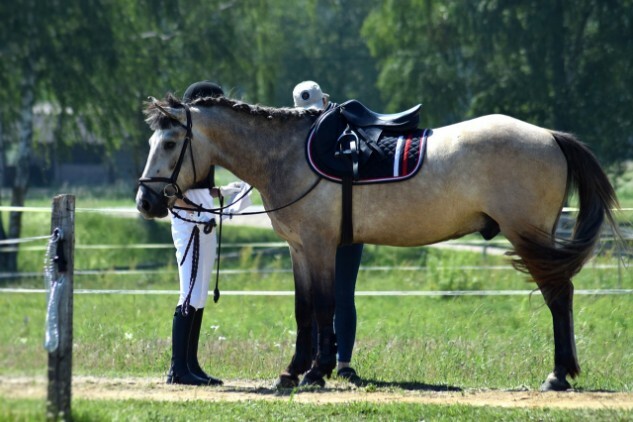 Shoes – Proper riding boots are best however if you are new to riding we do not expect you to buy these. Shoes best for riding have a smooth sole and a small heal to stop the foot slipping through the stirrup. Wellingtons are a recommended alternative for beginners. Other clothing – Always wear layers as you can remove them if you get to warm (ask your instructor for help with your horse before doing this). Depending on the weather you many need waterproof layers. We always recommend riders bring gloves. Jogging bottoms or thick leggings are a good alternative to jodhpurs. Unsuitable clothing includes shorts, trainers, skirts, flip flops, open toed shoes, shoes with no heel and strapless tops. If you are unsure what is suitable please ask a member of our team and they will be happy to help.